Some face jail…Some face confiscation or destruction of property. All are enduring violations of their basic religious freedoms. 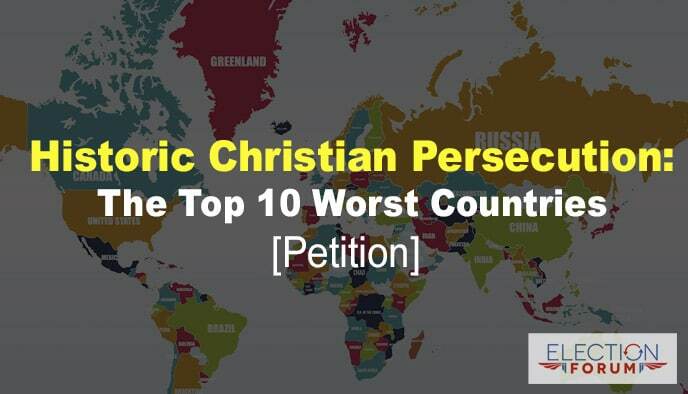 New to the top 10 worst countries for persecution of Christians is India. Hindu nationalists have taken over the country and their assaults on people of other faiths is violent and growing. China is now jailing pastors and Christians, editing the Bible, tearing down churches…and more. It went from #43 to #27 this year. Most of the countries on the top 10 are Muslim countries. I encourage you to sign our petition to help the persecuted church in India. Christians and Christianity bring stability and prosperity to any country. Please respect religious freedom, especially for Christians and Christian organizations. Why isn’t mainstream media reporting this!!!!? Christian Brits and Portuguese brought oppression, poverty, devastation, religious persecution, massacres, and starvation to India.